New digital products and services are coming to market ,,. Meet Revv card ,folks.. More on this card coming to this Steemit blog.. When we see the official rates, We shall be back here on this Steemit blog . 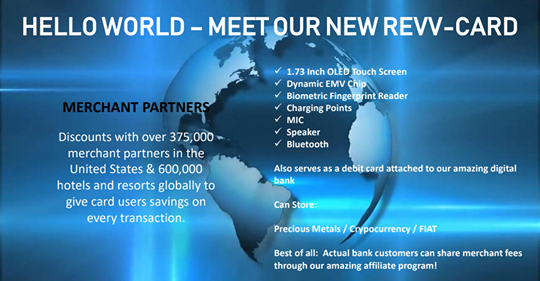 For now , lets look @ the 375,000+ vendors in the US and 600,000 worldwide who will offer discounts to card users. Steemians and World folks , we could have a digital bank account where we can store cryptocurrency, precious metals, and FIAT, (even regular money).Buzzirk goal is to strive to give correct information when goes to market,. #prelaunch (not financial advise and info is subject to change until launch,. ) Buzzirk will blog keenly after it goes live !!! People could be able to buy and sell cryptocurrency using their card after tapping their biometric thumb print so unless it is your thumb, no crypto will be bought and sold. High Security - Crypto Insured - Money in Bank FDIC Insured -- more info soon. #Rnetwork #rewards Contact your "R' affiliate about RevvCard - (Cryptocurrency HyperExchange wallet and exchange will be stored on your card. Think FINTECH meets BLOCKCHAIN. You published more than 30 posts. Your next target is to reach 40 posts. 3 years on Steem - The distribution of commemorative badges has begun! Happy Birthday! The Steem blockchain is running for 3 years.